Xerostomia (Dry Mouth) – Your body decreases saliva flow causing dry mouth, saliva flow is an important part of your oral health it helps wash away food particles and keep the mouth moist. When there isn’t enough saliva flow the tissues get irritated and swollen, bacteria thrives, and you are at higher risk of developing tooth decay. Periodontal Disease (Gingivitis or Periodontitis) – another complication of diabetes is that it causes blood vessels to thicken. This slows the flow of nutrients to and waste products from body tissues, including the mouth. When this combination of events, the body loses its ability to fight infections. Since periodontal disease is a bacterial infection, people with uncontrolled diabetes might experience more frequent and more severe gum disease. 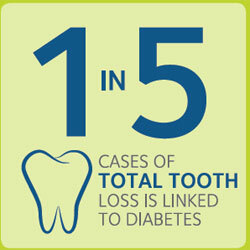 Delay in healing after dental surgery- People who have diabetes tend to have a slower healing time after dental surgery. Burning mouth and/or tongue — this condition is caused by the presence of thrush. People with diabetes who smoke are at an even higher risk — up to 20 times more likely than non-smokers to develop thrush and periodontal disease. Smoking also seems to impair blood flow to the gums, which might affect wound healing in this tissue area. Flossing and brushing daily at least twice a day- will prevent plaque from forming into build up and also prevents against dental caries. Regular dental check-ups-Have your teeth professionally cleaned every 6 months, or even every 3 or 4 months. Your dentist may suggest stepping up the cleaning schedule if you tend to build up plaque or tartar quickly. Avoid Smoking-talk to your doctor about ways to quit. These are a few ways you can take control of your oral health, but there is no better plan than to consult with Dr. Danial Kalantari/Smiles on Bristol Dentistry, to see what treatment and precaution benefit you. This entry was posted in Uncategorized and tagged diabetes, oral health, santa ana dentist, Smiles on Bristol on September 28, 2015 by khosrow. Do any of your teeth hurt when eating something sweet or cold? Or just taking a sip of coffee? If you had any of these discomforts then you might have sensitive teeth, this condition is common, many adults suffer from sensitive teeth at some point in their lives – and it is treatable. Cracked or Chipped teeth- may fill with bacteria from plaque, causing the nerve to inflame. Bruxism- grinding or heavy clinching of teeth wears down the enamel surface of the teeth. Exposing dentin causing tooth sensitivity. Acidic foods- such as lemon, citrus fruits, teas can wear down enamel. Gum disease- sore and inflamed gums create recession or pockets exposing the root of the tooth. Teeth whitening- products with peroxide or baking soda can seriously aggravate exposed roots or dentin. Age-Teeth are most sensitive between ages 25 and 30. Dental work. 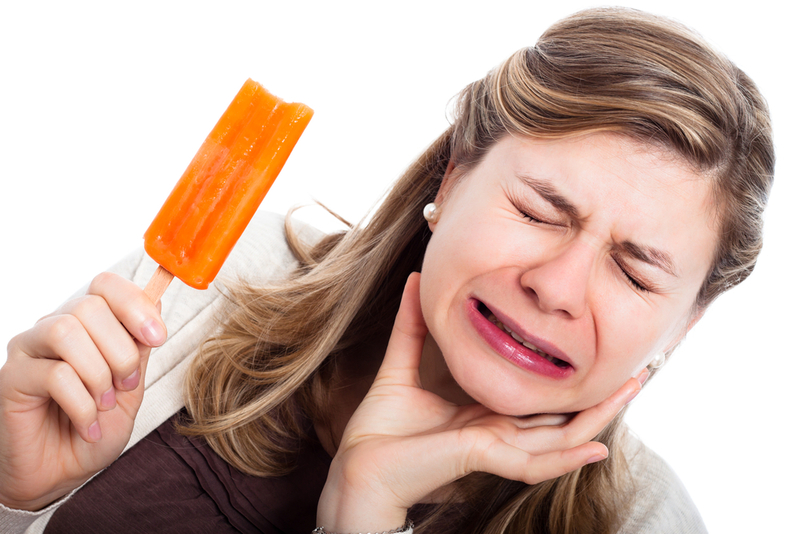 Teeth cleaning, root planning, crown placement, and tooth restoration can make teeth sensitive. Such sensitivity is temporary, if it does not get better after four to six weeks please consult with Dr. Danial Kalantari. Brush and Floss daily, this will prevent any plaque from irritating your gums and preventing cavities. Try desensitizing toothpaste which contains chemicals that block sensations like hot and cold from reaching the nerves in your teeth. Try different brands to see which works best for you. Use mouthwash and toothpaste that contain fluoride. Consult with Dr. Danial Kalantari if a night guard is right for you. If you still have discomfort, talk to Dr. Danial Kalantari. Depending on the cause and severity of your sensitivity, there are many procedures to relieve you from the discomfort. If you suffer from sensitive teeth, please be sure to contact Smiles on Bristol Dentistry/ Santa Ana. We can set up an appointment to discuss what is bothering you and determine the best way to address the problem. This entry was posted in Uncategorized and tagged santa ana dentist, sensitive teeth, Smiles on Bristol on September 22, 2015 by khosrow. Protecting your health has to be a holistic effort says Santa Ana Dentist, Dr. Kalantari of Smiles on Bristol Dentistry. Maintaining proper health is not a one stop effort, but involves getting proper nutrition, taking good care of your teeth, and also ensuring you get enough sleep every night. While under the stress of numerous responsibilities, many people let sleep fall by the wayside. However, sleep is key to overall health, and skimping on it could be putting your health at risk. The amount of recommended sleep varies on a person-to-person basis. For the average adult, the National Sleep Foundation recommends people get no fewer than 7 hours of sleep per night. While some people claim to be comfortable running on only four to six hours of sleep, studies have shown they are often overestimating their coping ability and experience greater lack of focus and increased fatigue. Many people have also become so accustomed to not having adequate amounts of sleep, they forget what being properly rested feels like. With seven hours being a minimum, eight hours is the average amount people are recommended to sleep, however a number of doctors will recommend patients get nine hours if possible. The average person has a sleep cycle of roughly three hours. By getting sleeping in multiples of three hours – such as nine hours—you wake up at the end of your natural sleep cycle and are left feeling more rested. Waking up in the middle of the sleep cycle, even after plenty of sleep can sometimes leave you feeling groggy as the body has to adjust to wakefulness from a deeper level of sleep. Children and older adults have different recommended sleep requirements than adults. Older adults can be alright with just six hours of sleep, whereas children need more sleep than adults. Teenagers do best with eight to ten hours of sleep and toddlers can need up to fifteen hours of sleep. During adolescence the brain is still developing and sleep is the number one time that the brain recharges and detoxifies. Without adequate sleep during childhood, children’s brains can be negatively impacted. According to researchers at the Brigham and Women’s Hospital, doctors studied a group of young healthy individuals. Simply by messing with their sleep schedule, some of the study participants ended up in a pre-diabetic condition until their sleep schedule was restored. The researchers also found that people who routinely do not get enough sleep are up to 200 to 300 percent more likely to catch diseases than people who are well-rested. People who do not have enough sleep also having higher rates of obesity, heart problems, and even mental conditions such as Alzheimer’s. Many people may also be getting enough hours of sleep but are still not getting enough rest because they suffer from a sleep condition. Most people with sleep conditions such as sleep apnea never go in for testing. Some are simply not aware, while others are put off by the idea of overnight sleep studies and CPAP treatments. A CPAP (continuous positive airway pressure) machine is a device that is worn with a mask while sleeping. It uses forced air to make sure air keeps getting to the lungs. This helps with sleep apnea because sleep apnea is a condition where due to a variety of causes, the patient does not get enough oxygen while sleeping. Some sleep apnea is caused by an issue in the brain, but most sleep apnea is caused simply because the throat becomes blocked by the jaw and the tongue during sleep. When people lie on their backs, often their jaw will settle backwards into the face which can, in certain people, cause an obstruction to the airways that prevents regular breathing. With the significant importance of sleep, people need to make sure they are getting proper rest. Fortunately for patients who have an aversion to using a CPAP machine, most doctors now prescribe a type of soft mouth guard that is specially developed by a dentist for each individual patient. This mouth guard keeps the jaw from sliding back so that the airways remain open. Unlike the CPAP, it does not require a mask or electricity which makes it more practical for everyday wear. Because it is specially fitted, it is no less comfortable than wearing retainers at night. For mild and moderate sleep apnea, the mouth guard is just as effective as the CPAP device. For people who struggle to fall asleep when they need to, adding physical exercise during the day can help put their body into a better rhythm. Additionally, taking time to be outdoors helps to reset the circadian rhythm so that your body is more prepared to fall asleep at proper times. Taking up yoga, meditation, or establishing a very specific before-bed routine can also help to quiet your brain and signal to your body that it is time to sleep. The human body responds very well to routine. By making a routine of actions that you only perform before bed, the body will begin to equate the routine with time for sleep. This entry was posted in Uncategorized on September 18, 2015 by meara. Everyone knows fruits and vegetables are essential to healthy eating, but Santa Ana dentist Dr. Kalantari wants to know if people know exactly why. Plant-based foods offer a wealth of nutrients and minerals hard to find in other sources. They are generally low in calories and can be eaten in a huge variety of ways. To get a better understanding of these amazing foods, we will discuss why you should start incorporating more fruits and veggies into your diet. Fruits and veggies often contain healthy amounts of dietary fiber. Fiber is well-known for keeping the digestive system running smoothly. It also has been shown to help with heart health. Fiber is hard for the body to digest which makes it take up space in the digestive tract before it is eliminated. This additional substance helps people feel fuller, longer. For people trying to lose weight, this can help prevent overeating. Additionally, most fruits and vegetables are low in calories further helping in any weight loss efforts. Fruits and vegetables offer two types of fiber – soluble fiber and insoluble fiber. Soluble fiber can be broken down by the digestive tract but is converted into something like a gel. This slow-moving gel is what helps people to feel full. Insoluble fiber cannot be broken down by the digestive tract at all and therefore helps prompt the body to move it out of the system. This boosted movement helps to clear out food in a regular manner, preventing things from getting clogged up. With the regular flushing of the digestive tract, bad bacteria and other unhealthy substances do not get a chance to linger in the body. Beans, nuts, and cucumbers offer high amounts of soluble fiber, whereas dark, leafy vegetables and carrots provide large amounts of insoluble fiber. A great thing about fruits and vegetables, however, is that often they provide both soluble and insoluble fiber for a one-two punch of health. Fruits and vegetables are a major source of antioxidants as well. According to researchers at Penn State University, antioxidants are able to eliminate harmful molecules called free-radicals. These molecules have unpaired electrons. Because electrons travel in pairs the unpaired electrons attempt to draw electrons from other sources. However, in the body, the only other electrons to be found are already part of important molecules and body cells. When the stray electrons pull on electrons from the body, the cells become damaged. Too much free radical activity can wreak havoc on what would have otherwise been healthy cells. Antioxidants help fight free radicals by either providing them with a missing electron, therefore saving an important body cell from doing the task or they can even break apart free radical molecules so they can no longer cause damage. The damage from free-radicals has been linked to many serious conditions including cancer, while treatments with antioxidants have actually reduced the rates of cancer and of the return of cancer. Antioxidant rich fruits and veggies include blueberries, grapes, raspberries, strawberries, broccoli, spinach, kale, sweet potatoes, and carrots. The last reason fruits and vegetables are essential is due to the huge range of vitamins and minerals they offer. No other food group offers such a range of nutrients. There are 13 essential vitamins which include Vitamin A, Vitamin C, Vitamin D, Vitamin E, Vitamin K, Vitamin B1, Vitamin B2, vitamin B3, Pantothenic Acid, Biotin, Vitamin B6, Vitamin B12, and Folate. Minerals that are important to the body are sodium, chloride, potassium, calcium, phosphorus, magnesium, sulfur, iron, zinc, iodine, selenium, copper, manganese, fluoride, chromium, and molybdenum. The essential vitamins are the most important vitamins to maintain proper function, but all of them are needed to some degree to keep the body in tip-top shape. Dark, leafy vegetables tend to be the more bitter food options you can choose, but they offer the greatest amount of vitamins and minerals all in one place. There are many recipes available offering tips on how to make them taste great. A helpful option is to chop them up and mix them in with pasta or a stir fry to get their vitamins but not feel like you’re simply chowing down on a meal of leaves. Broccoli, spinach, kale, collard greens all offer a wealth of important nutrients. Not only offering vitamin A, E and K, they also contain calcium, magnesium, manganese, and iron which can be hard to find in other food. Fruits such as oranges, pineapples, and grapefruit offer vital Vitamin C which promotes immunity. Oranges also offer folate which is important for everyone but especially important to pregnant women. Bananas offer potassium. Carrots and sweet potatoes deliver vitamin A. Avocados have a selection of B vitamins. Certain fruits and vegetables, such as cranberries, can even offer antibacterial properties. Doctors have long recommended drinking cranberry juice when someone has an infection as the properties in the berries can help to kill the invading bacteria. Guava fruit also offers antibacterial properties. Fruit and vegetables can be eaten on their own, cooked, sautéed, baked or they can be mixed in with other foods. By mixing your fruits and vegetables into a meal, you can easily up your consumption and also increase the variety of fruits and vegetables you eat in a single meal. The sweetness of fruit can be a great way to sweetly compliment a savory dish, while veggies can provide a refreshing lightness to otherwise heavy dishes. This entry was posted in Uncategorized on September 14, 2015 by meara. According to Santa Ana Dentist, Dr. Danial Kalantari, of Smiles on Bristol Dentistry, dental health helps to protect overall health. Another way to help your overall health is through a nutritional diet. Healthy eating has a bad rap for bland eating that requires handing over all your beloved treats to munch on celery and carrots from the rest of your life. While healthy eating does require some changes, it is actually quite flexible allowing for both treats and the celery. The most common American diet relies on red meat and the addition of a starch, usually a bleached, white carbohydrate. Think about common American staples – hotdogs with their buns, burgers in buns with a side of French fries, steak and potatoes, Philly cheesesteaks, fried chicken, etc. When people branch away for these staples, they usually head in the direction of pasta dishes and pizza, loaded with cheese, white carbohydrates, and some amount of veggies in the sauce. While all these dishes can be great, when eaten as a diet, they do not provide a balanced or nutrient-rich offering. The first tip for healthier eating is moderation. Feel free to keep eating your favorite foods, but simply start mixing in some variety to create a more balanced diet. Everyone needs vegetables, fruits, complex carbohydrates, protein, and water in their diets. The human body needs a large range of vitamins and minerals to function properly. A lack of these essential nutrients can cause both physical ailments, such as anemia and brittle bones and mental ailments, such as depression. Even certain degenerative mental disorders may have a link to malnutrition such as Alzheimer’s and dementia. By eating from a full range of food sources, you are able to intake the whole spectrum of nutrients the body needs. Even a diet of just “healthy” foods such as trying to live off only green, leafy vegetables will create issues in the body. These vegetables do not offer protein which is the essential ingredient to most body structures such as hair, nails, muscles, and cartilage. To know how you should moderate your meals, you need to know the function and benefits of the different types of food groups. Carbohydrates, commonly called carbs, often get a bad rap. Carbohydrates are anything that the body can break down into sugar which is then used as energy for the body. While eating sugary foods can be bad as they promote tooth decay, are often high in calories and low in nutrients, and cause blood sugar spikes and drops, sugar is still essential to a properly function body. The best way to get your sugar is through complex carbohydrates such as whole grains. The whole grains require time for the body to break down into sugar and therefore do not have as damaging effects to the teeth while providing sugar over time to prevent blood sugar spikes. Whole grains are also packed with fiber which helps keep the body full, prevents overeating, and helps to keep the digestive tract running smoothly. They also offer a selection of B-vitamins and contain essential minerals such as iron, magnesium, and selenium. Most Americans tend to opt for “white carbohydrates,” such as white bread, white rice, or they go for things like French fries and potato chips. White carbs have been highly processed and through their processing, they lose the majority of their nutrients and almost all of the fiber. Additionally white carbs tend to be reduced down to simple carbs that cause the spikes in blood sugar. Replacing white carb options with whole wheat options can be a great and simple way to change to healthier eating. Whole grain foods vary widely in taste, so try a few different brands to see which one tastes best to you. Starchy vegetables such as potatoes, sweet potatoes, zucchini, and corn offer complex and simple carbohydrates, as well as vitamins and minerals. They can be another great way to add nutritional carbs to your diet. Some preparations loaded with cheese, butter, oils, salts, or others can be delicious but may take down your healthy carb with the overload of fats and salts. Having a loaded baked potato as a meal can be a good, healthier treat option rather than having the calorie heavy loaded potato as a side of something else. French Fries and potato chips may have come from potatoes but through their cooking process, they lose most of their health benefits. Carbohydrates should make up most of your calories each day. By making those calories count nutritionally with whole grains and nutrient-rich starchy vegetables, you can keep the carbs you love while giving your body the resources it needs to function properly. Replace buns and toast with whole grain alternatives. Try brown rice or a rice-alternative, such as quinoa, to get additional nutrients white rice does not provide. This entry was posted in Uncategorized on September 10, 2015 by meara. With the organic, gluten-free, high-protein, low-carb, low meat, high exercise… etc. health fads of today, being healthy can seem impossibly complicated says Santa Ana dentist, Dr. Danial Kalantari, of Smiles on Bristol Dentistry. However, for the average person, being healthy is not very complicated. Athletes and people with special conditions may require special diets and routines, but for most people there are a few simple tricks that can transform an unhealthy lifestyle into a healthy one. The first step towards healthy living is healthy eating. What to eat can also be one of the most complicated aspects of leading a healthy life. There is a wealth of tips and information about it which depend on different lifestyles and health goals. However, overall, the things to remember are a diet high in fruits and vegetables with healthy carbohydrates and enough daily protein. Intakes of fat should be low but not excluded completely. The body needs nutrients to function properly. Fruits and vegetables are packed with essential vitamins and antioxidants to maintain all the proper bodily functions. They are also full of fiber which helps digestion and creates a full feeling that prevents over eating. Many common meats can be high in fat, calories, and cholesterol so meat should be consumed in small amounts. Even small amounts of most meats provide plenty of protein and offer all 9 essential amino acids. Vegetarian protein options such as nuts and beans are great because they offer many additional nutrients, fiber, and healthy fats, but most do not offer the full range of amino acids. Multiple types of nuts and beans need to be consumed daily to get the full range of protein for people relying on a vegetarian diet. Some dairy is recommended as it has high levels of teeth and bone strengthening calcium. Maintaining a mostly, fruit and vegetable dependent diet will not only give your body the broad range of nutrients it needs, but will also help prevent too much calorie consumption that leads to obesity. Obesity is a risk factor and cause for a number of body issues and should be taken seriously. Many of the most fattening foods are simple carbs (cakes, pies, white bread), cheese, red meat, and sugary foods. Many restaurants will create foods with taste in mind over health so a meal that might be 600 calories when made at home, can be 900 or more calories at a restaurant. Considering a sedentary adult may only need 1,500-1,600 calories a day, eating almost 1,000 calorie meals can quickly add up. There are online calculators that use body size, weight, and activity level to estimate your personal daily needed calorie consumption. Your doctor or a nutritionist can also give a more specific number to help you make sure you are not eating too little or too much. Most people also know exercise is important to a healthy life. It increases lung and heart function, strengthens muscles to relieve back and joint pain, helps with weightloss, and boosts endorphins. Most people, however, may not be aware that exercise does not need to be a major change in their life. Ideally a person should aim for at least 30 minutes a day of movement. This does not have to be all at once and does not have to be “typical” exercise. It could be taking 15 minutes to chase your dog in the back yard, or taking three brisk 10 minute walks around the neighborhood throughout the day. Even adding simple things in your life such as parking farther from the store so you have to do some extra walking, taking a few laps around the office during work, or taking the stairs can really add up. Looking for opportunities to be a little more active can really add up. Adding just a 15 minute walk everyday has been shown to add years to a person’s life expectancy. Standing up more often throughout the day has also been shown to increase the chance of a long, healthy life. Sitting constantly actually harms the body and contributes to back, joint, and neck pain, as well as an increased risk of obesity and increased levels of heart disease. Taking more opportunities to stand during the day can be a simple, but surprising boon to your health. Other things that can affect health are making sure to have a good support group and to make sure to laugh often. Laughing helps reduce anxiety. Anxiety is known to cause a great amount of stress on the body, weakening it, causing mental and physical issues, and opening the body up to infection. Laughing reduces the hormones that cause anxiety and boosts endorphins that make you feel happy and healthy. People are also social creatures. Many studies have shown that isolation and loneliness can have just as hard a toll on the body as stress can. Making sure to get outside and engage in social functions or connect with a close friend or family member can help boost happiness and health. Keeping your teeth healthy is another way to keep your whole body healthy. The mouth is the first line of defense and also the easiest way for bacteria to enter the body. Proper oral hygiene techniques reduce the amount of bacteria in the mouth and reduce the chance of infections elsewhere in the body. The common disease, gingivitis, is a buildup of bacteria in the gums. The gums become inflamed as the immune system tries to fight off the bacteria. Without proper care, the bacteria will stay and the body’s immune system is weakened from constant exertion. Additionally, the consistent inflammation puts pressure on the vascular system and increases a person’s chance for developing heart disease. Just by improving your diet, standing more frequently, enjoying the neighborhood on a daily walk, having a laugh with friends, and taking good care of your mouth, you can be living a healthier, happier, and longer life. This entry was posted in Uncategorized on September 7, 2015 by meara. According to Santa Ana, CA, dentist, Dr. Danial Kalantari, of Smiles on Bristol Dentistry, dentists mainly concern themselves with the teeth and the structures that support the teeth. Oral medicine doctors focus more on diseases that affect the mouth and lower part of the face. They will also concern themselves with teeth for patients with unique situations, such as cancer patients who have special oral needs due to radiation treatment. They help patients with systemic diseases that have symptoms that manifest in the oral region. Diseases include Lichen Planus which is thought to be an autoimmune disorder that attacks the skin and mucous membranes. It is characterized by legions that tend to look like lichen, hence the name. Certain dental appliances can create similar lesions so an oral medicine doctor may be consulted to determine whether the lesion is dental related or caused by the Lichen Planus disease. There are oral specific Lichen Planus strains that affect the mucous of the mouth, as well as, mucous in the throat. Most patients with mucosal Lichen Planus have it in multiple locations. Another disease oral medicine doctors look for also affects the oral mucous membrane. It is called Behçet’s disease and is a rare form of vasculitis, aka a disease that destroys blood vessels. Behçet’s disease creates small ulcers and is systemic, attacking many parts of the body. This disease cannot be cured, and treatments are used mostly to help mediate the symptoms. Pemphigus Vulgaris is another autoimmune disorder. It causes painful, blistering skin lesions. Along with the skin, is can attack mucous membranes, making it another target for oral medicine doctors to look for. Oral medicine doctors are also specially trained to identify oral cancer and pre-cancerous areas called Leukoplakias or Erythroplakias. Dentists will look for signs of oral cancer but tend to be more occupied with handling the many areas of dental care. Leukoplakia and erythroplakia does not refer to any disorder in particular but show up as white areas on the mucosal areas of the mouth. When they cannot be identified as any other type of disorder, they are categorized as areas of damaged tissue which are more susceptible to contracting cancer. They show up most often in patients who smoke and the chance they turn malignant varies. These white patches generally have no symptoms and cause no side effects to patients, but doctors will want patients to come in for consistent checkups of the spot to make sure it does not develop into a malignant cancer. Pain in the oral and lower facial region not caused by dental issues may also be diagnosed and treated by an oral medicine doctor. This can include Neuralgia which is a broad category covering pain and issues to the nerves. There are different types of neuralgia depending on where it manifests. Nerve damage can result from trauma, infections, and pressure from inflammation or tumors. The symptoms generally include strong pain, but can also feature an itchy feeling or the feeling of an electric jolt. Pain can be consistent or sharp and sudden. Neuralgia near the oral cavity and in the head can cause headaches that are easily mistaken for migraines. While sometimes hard to diagnose, neuralgia is found by using different techniques to locate damaged nerves. Oral medicine doctors also help with atypical facial pain, which is pain that cannot be diagnosed as any other condition. Generally, these conditions have symptoms that do not match any known diseases or disorders or that do not respond properly to tried treatments. They are knowledgeable in treating chemo and radiation induced disorders of the head including oral mucositis and osteonecrosis. Oral mucositis produces ulcers and inflammation in the oral mucous membranes. While mucositis is not particularly common in most patients undergoing radiation treatment, cancer patients who are receiving chemo or radiation treatment to their head or neck have much higher chances of developing mucositis. Radiation can also damage bone tissue which is causes osteonecrosis. This can cause severe problems for the skull, jaw, and teeth. Oral medicine doctors can diagnose this condition and help patients retain as much bone tissue as possible. Sjögren’s syndrome, burning mouth syndrome, and temporomandibular joint dysfunction (TMJ) are other conditions oral medical doctors commonly treat. Sjögren’s syndrome is another autoimmune disorder that causes chronic dry mouth because the body’s white blood cells attack and destroy the salivary glands. Dry mouth is a common condition that increases the chance of tooth decay. However, due to the systemic nature and severity of Sjögren’s syndrome, it requires special treatment beyond usual dry mouth fixes. Burning mouth syndrome unsurprisingly causes a patient to have a burning sensation in the mouth. An oral medicine doctor will first try to find underlying conditions that could cause the symptom and if no conditions can be found, will provide treatments to help soothe the symptoms. TMJ refers to any improper function of the joint connecting the jaw to the skull. With their expertise on the facial anatomy, oral medicine doctors can sometimes provide more accurate diagnoses and treatments to patients suffering from TMJ pain. This entry was posted in Uncategorized on September 3, 2015 by meara.